Charles E. Schmidt was elected national commander of the 2.2 million-member American Legion on Sept. 1, 2016 in Cincinnati, Ohio, during the 98th national convention of the nation’s largest veterans organization. Schmidt enlisted in the U.S. Air Force in 1965 and served on active duty until his retirement in 1993. During that time he advanced from an administrative clerk to become a distinguished graduate of the Air Force Officer Training School, earning a commission and assignments to Executive Support Officer positions at major headquarters. His Air Force assignments took him to Oregon, California, Montana, Nebraska, Colorado, England, Germany, Philippines and Vietnam. As an active duty servicemember, Schmidt joined Story-Hardin Post 164 in Craig, Mo, in 1984. After his military retirement as a major, he was employed by the Air Force Total Quality Management Program at Lowry Technical Training Center in Denver, Colo. He transferred his American Legion membership to Harney County Post 63 in Burns, Oregon, and helped revitalize the department’s Tenth District after moving there and beginning a 15-year career at the Greater Oregon Federal Credit Union. He retired from the credit union as the executive vice president. He is a Paid Up For Life (PUFL) Legion member. 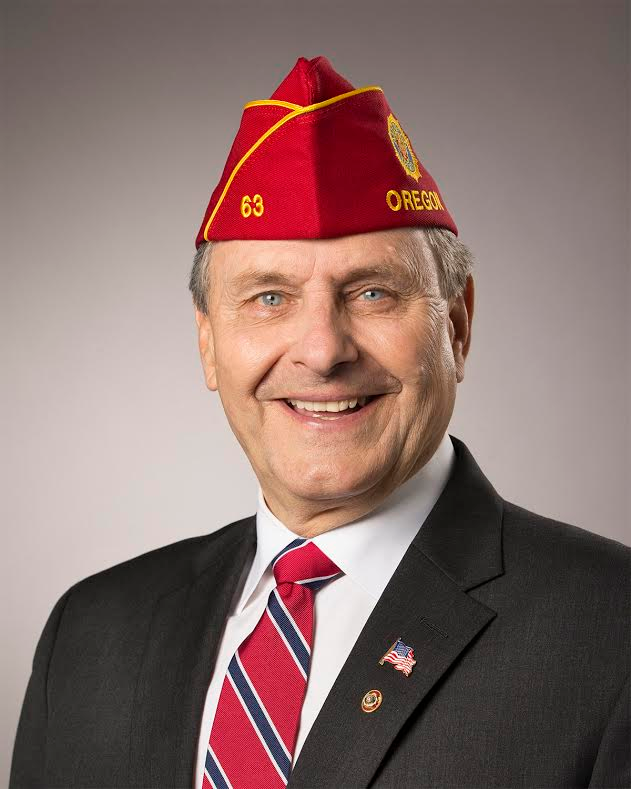 Schmidt served as department (state) commander of the Oregon American Legion in 2004 and 2005. He has served at every level of The American Legion, including National Executive Commiteeman from 2005-2016. Gov. Theodore Kulgonski appointed Schmidt to the Governor’s Advisory Committee to the director for the Oregon Department of Veterans Affairs in 2004. He was appointed to a second 4-year term in 2008. While serving in the Air Force, Schmidt earned a Bronze Star, a Defense Meritorious Service Medal, a Meritorious Service Medal with 2 oak leaf clusters, a Joint Service Commendation Medal, an Air Force Commendation Medal with one oak leaf cluster, an Air Force Outstanding Unit Award with Valor device and two oak leaf clusters, the Air Force Good Conduct Medal with three oak leaf clusters, a National Defense Service Medal with bronze star, a Vietnam Service Medal, an Air Force Overseas Short Tour Ribbon, an Air Force Overseas Long Tour Ribbon with two oak leaf clusters, an Air Force Longevity Service Award Ribbon with one silver oak leaf cluster, an NCO Professional Military Education Graduate Ribbon with oak leaf cluster, a Small Arms Expert Marksmanship with bronze star, an Air Force Training Ribbon with oak leaf cluster, a Republic of Vietnam Gallantry Cross with Palm, and a Republic of Vietnam Campaign Medal with four bronze stars. Schmidt resides in Hines, Oregon, with his wife, Linda. They have two daughters, Andria and Cori, and two sons-in-law, Peter and Anthony. They also have six grandchildren: Madeline, Alex, Adam, Raymond, Nicholas and Thomas.